My favorite school lunch growing up was the Ham and Cheese Roll-up day. 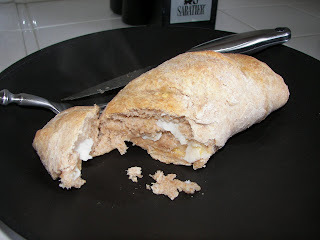 This weekend I decided to make my own roll-ups, but all we had at home was turkey. They were really good!!! Make the bread dough, up to the point where you let it rise. After it has risen, divide it into two halves. One half will make 2 roll-ups. Roll each half into a rectangle. 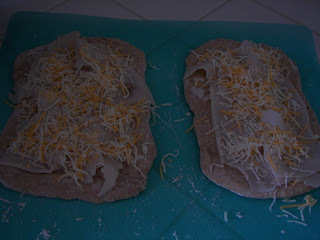 Place lunch meat on the dough, and then sprinkle with cheese. 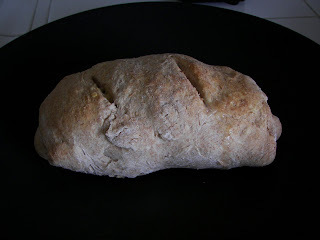 Roll the dough to close it, starting with one of the short ends. Roll all the way up and pinch the sides to seal every edge. Make 3-4 slits on top of the roll-up to release a little air as it cooks. Spray tops with cooking spray.